If weights have been recorded in the Livestock screen, the report will include either total weight per animal and stock class on hand at the beginning and end of the financial year. To ensure the weight information is consistent, we recommend making sure you record live weights for everything from opening and closing weights per stock class, through to sales & purchases. If values have been recorded in the Livestock screen, the report will include total values per stock class on hand at the beginning and end of the financial year. 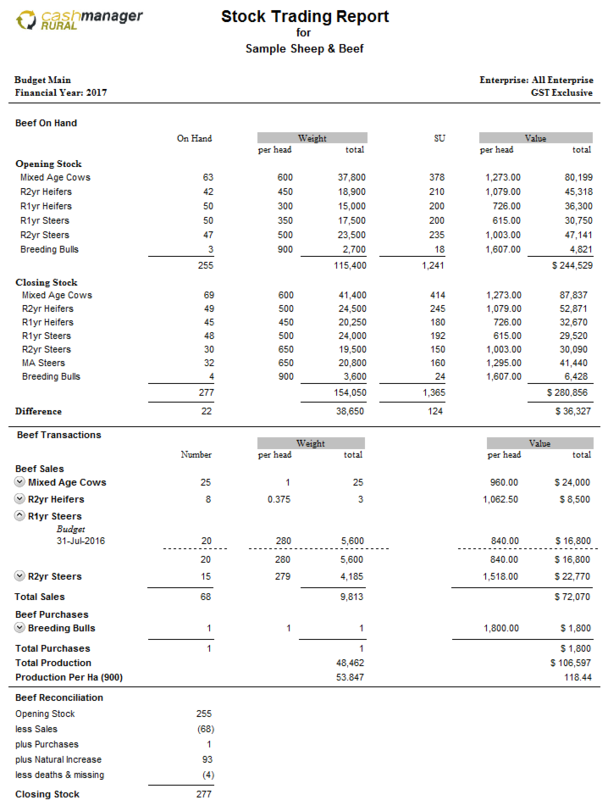 TIP: Enter the effective ha of your farm into the Setup - Business menu so that the report includes production per Ha in terms of weight and value. The Stock trading is a financial year report which means it will include all payable and receivable transactions. For example, if you sell stock on 30 June 2017 (the 2017 financial year) and receive payment in July (the 2018 financial year), the transaction will appear in the 2017 year report. You can also use it while looking at actual, budget or revised information. a. 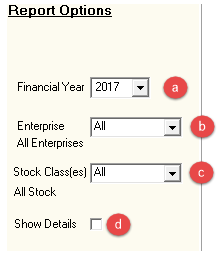 Select the financial year you want to view. b. If you use the enterprising tool, you can focus on a specific area in your business. c. The default view includes all stock classes in your database however you can focus on a specific class i.e. beef. d. Expand all purchase and sale transactions within the report.